A single long stem red rose is an eloquent way of expressing your love on Valentine`s Day. Our beautiful red rose is presented in a Flowers for Everyone signature gift box and nestled in folds of soft black tissue. One rose for your one love. The perfect Valentine flower! Ordering flowers for Valentine`s Day can be done either online or by calling our friendly consultants on 1800 66 66 46. *Please note: The pictured gift box is an exclusive design for Sydney deliveries. 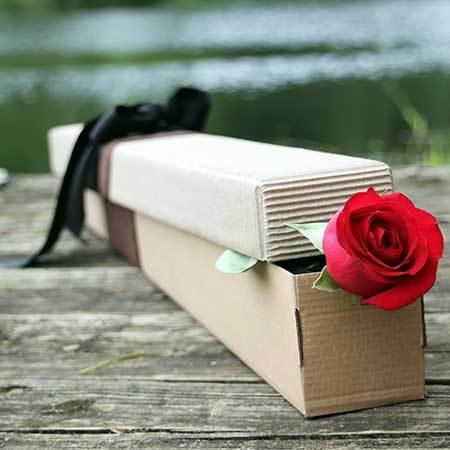 For Valentine`s flower delivery throughout the rest of Australia, the team will coordinate your red rose via an affiliate florist network to recreate our style as closely as possible. Questions? Give us a call on 1800 66 66 46! 2016-06-15 Service rating : Amazing service and quality.